​WHAT IS THE COST OF MEMBERSHIP IN THE JAZZ SOCIETY, HOW DO I JOIN, AND WHAT ARE THE BENEFITS I WOULD ENJOY AS A MEMBER? ​Annual cost of membership is $20 per person and $30 for couples. Sponsor $300 - Patron $100 - Donor $50. You can join by attending one of our jazz jams and join at the sign in desk. 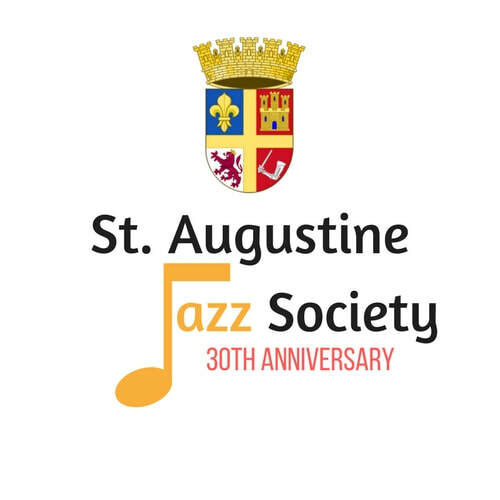 Or you can go to staugustinejazzsociety.weebly.com and click on become a member. You will find a membership form you can print directly from the web page and mail to the Jazz Society with your check. The address is on the form. Membership in the Jazz society gives you discounts to the Jazz Jams and concerts/events. You will also receive our newsletter giving details and write-ups of events and activities of the SAJS. ​IS THE JAZZ SOCIETY AN ORGANIZATION JUST FOR MUSICIANS? ​No, not at all. Most of our members are not musicians. Our goal is to share our appreciation and enjoyment of live music with all jazz enthusiasts. ​ I AM A MUSICIAN WHO WOULD LIKE TO PARTICIPATE AT THE JAZZ JAM. DO YOU ALLOW MUSICIANS TO SIT IN? ​ Yes, if you are an experienced musician just bring your instrument to the Jam, and sign in at the front desk. Someone will advise you as to what set you will play. I am seeking financial assistance for college tuition. how i can i receive help from the SAJS? 1. To Middle and High school students in St. Johns County for jazz band camp at the University of North Florida. 2. College students who wish to continue their music education in jazz studies. I am a Musician who would like ti be the featured guest at one of the jazz jams. Who do i contact? Please contact our Events Coordinator, Don Stockman at donstaug8849@att.net. We appreciate your interest in the Jazz Society!